aka: Why I could never be a chef! What is it with the oxtails? Last week, over dinner at The Blue Plate, I caught up with a friend, a San Francisco native, who had just returned to the city after 18 months working in Australia. "Why is it? ", she said, "that every menu in town has oxtail on it? When I left it was the butternut squash that was ubiquitous, now it's the oxtail." Ubiquitous or not, I couldn't help but order the Blue Plate's version, oxtail and mushroom bruschetta, pine nuts and preserved lemon and it was so delicious, I immediately resolved to learn to cook oxtail as soon as I could. "My father remembers growing up during the Depression that oxtails were considered food for people without much money (of which he was one). You could get them for pennies a pound. Now they are considered choice - hard to come by and expensive. He figures that the "gourmandes" finally caught on and have driven the prices up, much to his regret." I paid $20 for a bag of oxtails which may sound steep, but I did purchase them at Prather so I could be certain that the beef had been produced using only sustainable organic agricultural practices. The guys kindly gave me a discount, I have no idea why, the price on the label was actually over $23. But in the grand scheme of things, a $3 saving didn't ease the blow that much. On top of the meat, the stew contains a multitude of vegetables, all of which are strained out of the stew before the final presentation: 6 onions, as many carrots, a whole head of celery, a mass of mushrooms, lots of leeks and tons of tomato (I used my puree, frozen from when tomatoes were still in season)*. And then there was the wine - two whole bottles of my finest red that were reduced to practically nothing, along with a generous splash of dry white and a good slurp of port. I'd be lucky if I managed to make this recipe for under $100! And then the recipe instructions are confusing, even for me who is not a total novice in the kitchen. At every stage they fill me with doubt over my actions. Why does Heston worry about people biting on a peppercorn when further down the line the sauce is strained anyway? 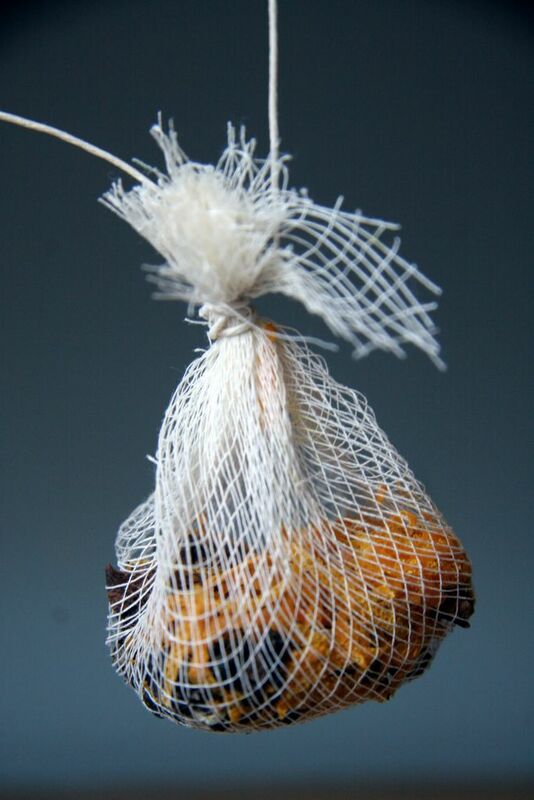 Did I really have to place the spices in a little muslin parcel? "Quarter the onions", Heston says, "it's easier to remove them later". But Heston, unless I am missing something you never tell me to 'remove them later'. And what about the part when I nearly burnt down my kitchen. I was actually scared at that point, to tell the truth. What do you mean by "unrefined sugar"? 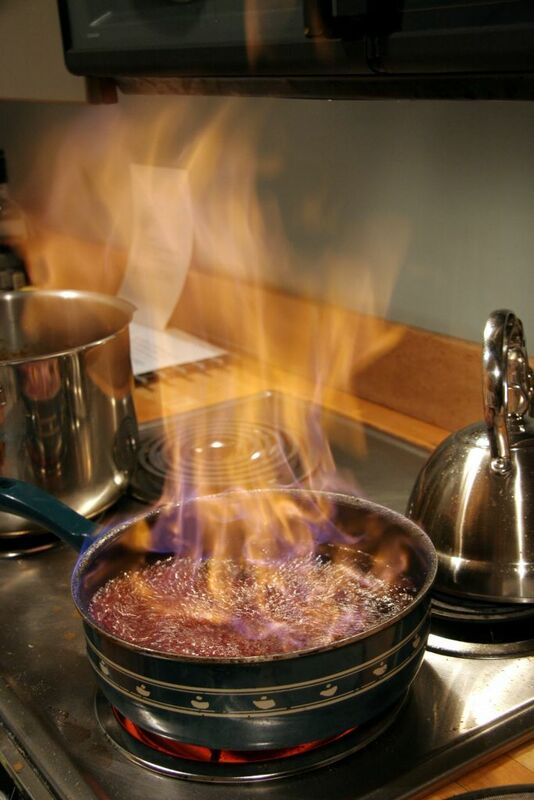 Have you ever tried caramelizing natural pure cane sugar, Heston? There is no caramelizing as far as I can tell - just melted or burnt, nothing in between. Despite all of this, and the added expenses of leaving the oven on for 10 hours whilst I cooked the stew over night, and having to open the bottle of Chateau Neuf de Pape to accompany dinner because, frankly after what I'd been through in getting this stew to the table, nothing else in our cellar would have done the meal justice, the result was very rich and very tasty. In fact I would go so far as to say it was the most delicious stew I have ever eaten. But was it worth it? Was it worth the effort? Was it worth the $100+ bill? I don't quite think so. I could have happily eaten a Chef's tasting menu at Manresa for that price without even lifting a finger. *Don't fret my frugal friends, I have saved these important vegetable players, dismissed from the grand stew finale on a fancy whim, to star in another dish on another day. Wow this looks so delicious, but at a cost. Oxtail was definately a poor man's meal when you were a youngster. I only cooked oxtail ( soup) once and you did not like it at all. I have to say it was not prepared with such loving care. That photo has given me a longing but I don't think I will be attempting to copy you any time soon. I've never had oxtail before - I may have to give this a try. My gran used to make oxtail stew. It took a long time, but didn't have wine or port in it and she left the vegetables in. I'm going to buy one and try and recreate her recipe. I'll share when it's done. It does look brilliant Sam. Oxtail's a luxury? Wow. For once I'm glad we were behind the times when we lived on our little island. I had the same reaction when I bought oxtail a few months ago. Since when did these "cheap cuts" become so expensive! But in addition, that recipe you were using just sounds like it was badly written... grr, always frustrating. I think the real reason things like oxtail are so pricy is that after the second world war, when people were more affluent, it fell out of favor to eat...so nowadays it is pricy because no one produces it and shopkeepers find it expensice to keep in stock since so few people buy it. It it became truly trendy again, prices would drop like a stone. I can never turn down a good stew but honestly I have never heard anything aobut Oxtail till now. Is it a California thing? I am from Chicago??? I love to cook but after reading what you went through, maybe I will try and find a restaurant. I just don't have the patience. Oxtails are definitely not a California thing. I had them in Oklahoma while growing up, and often in Iowa during those winters. It does seem to be a wintertime food. 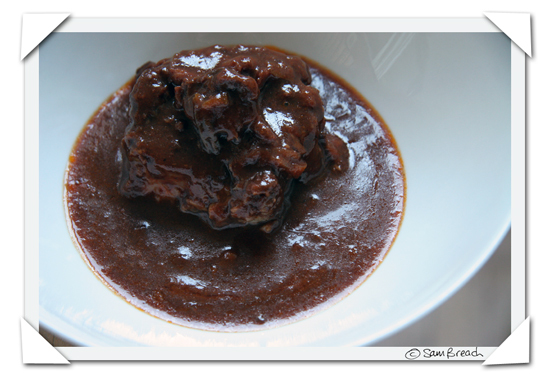 I have a very easy recipe that I use from time to time for oxtails and other slow-cooked cuts. I get mine from NFR Natural Beef or, more often, from the local supermarket (Nob Hill). The fire pix is lovely! I think almost any cut of meat can be lingered into beautiful succulence. It's just a pity that those which are destined for it have become so trendy these days. Ah well. I guess that is why so many places are getting down and dirty with hamburgers and hot dogs! As for me, I'll keep with stew meat, which seems to stay pretty cheap, at least around here. Damn. Gotta go find me some oxtail now, and I don't think I can go back to 99 Ranch for it. Heston is an amazing chef, but he's not much of a cookbook writer. I've made a few of his recipes from the Guardian (baked beans, strawberry soup) and been both confounded and somewhat disappointed. Slightly less confounded and disappointed with the recipes from his "Perfection" book, but still not blown away, especially given the amount of effort. Don't hold it against him or the Fat Duck, though. I had no idea the price of oxtail has risen so much. I was just telling some family the other day that it was a cheap cut of meat, and in my head I was planning an oxtail feast for the future. I suppose I'll have to make the oxtail a garnish and make a feast of something else. Duck? Sure, that will save me alot of money. I bought some grassfed, blah blah blah, Bison oxtail a few months ago and it too was wicked expensive... Sustainability don't come cheap unfortunately... but that's another argument for another day. the stew looks beautiful! Herr Blumenthal should be embarassed that he doesn't have anyone editing his recipes for clarity. Unless he likes them sloppy so that no one can cook them, thus forcing people to go to Bray to taste his food. Maybe I'll leave Heston's cooking to Heston, his 'In Search of Perfection' TV series was well worth watching though - if only for the part where he suggests that you can aerate chocolate at home using a dyson, a vacuum bag and a tupperware box! hi everyone - I am sure I could have gotten much cheaper oxtail than I did, but these ones were from a good reputable butcher where I know that the animals were raised comapssionately and I am happy to pay the preimium for knowing that. I think it was the amount of alcohol in the recipe which really pushed the price through the roof more than the oxtails. I have been eating oxtail tortillas for lunch and they are really delicious, mmmm! Today I am going to try a tortilla with oxtail and with avocado and lime, I think it will be perfect. another note - I am in the middle of reading In Search of Perfection - I havent got to the bt with the Dyson yet, but I DO HAVE a Dyson, of course, which I imported from England, and I am game for anything. Thanks for the recipe Leisure Guy. It looks like I will be on the hunt for some Oxtail! Sam so what exactly do you put in your Oxtail tortillias? Sounds interesting???? Thanks Leisure guy for your recipe! I will try that as soon as my hunt is over for some Oxtail. Anyone has any idea's on where to find it in Chicago????? So Sam what do you put in your oxford wraps? ox tails are good! You just reminded me that I need to make this filipino recipe for oxtails called kare-kare which has peanut butter in it. for lunch i had rancho gordo tortillas with this oxtail stew meat shredded in its sauce, with a little avocado, peppercress and just a squidgeon of lime. It was good, but i think also that adding a vey crunch vegetable to the mix, like a radish would work well too. Since Heston uses pickled Daikon with his, i believe he might not disagree with me. trouble is i am running out of oxtail stew to try these experiements with and I am not sure I am up for making it again so soon. *sigh* Few food trends have annoyed me as much as what faddish "gourmandies" have done to oxtail, which used to be a staple on my family's table. China is a country used to famine, with a very small percentage of arable land and a large population. We unlocked the deliciousness of oxtails out of self preservation centuries ago. Now it's hip and my father's favorite soup, a simple broth made using oxtail, is prohibitively expensive. I'm one pissed off panda. This really struck a chord with me! - I had a similar experience making a stew with chuck roast last weekend - a 3.5 pound roast was $13.00 at Whole Foods and that's a "cheap" cut of meat! I also had similar issues (though not as severe) with cooking it and with the liquid disappearing. It wasn't all that great, and I haven't decided whether to post about it or not. The oxtail looks wonderful, but I'm with you on the complexity of his recipes. I bought his new cookbook but I'm considering it in the non- fiction category rather than the practical!! One cake takes about a week to make!! You can sometimes get ox-tail stew cheaper when you go to ethnic(hispanic) food stores. Sam's club had some reasonable ones. Better than the 4buck a pound kroger wanted. To Sarah, Editor: Since you live in Chicago, you MUST go to Manny's coffee shop on Fridays. It is on that day that they have the absolute best Ox-Tail Stew. It is literally to die for. Bring a friend or a large appetite as their servings are quite large. Kinda pricy too but it is worth every penny. Go early for lunch as they run out early. Go to their website to double check on the day. Pretty sure its friday but it might be thurs. Also, one of those days they have stuffed breast of veal which is smokin! Alice - you could post against it as a warning? clareuk - i am enjoying his book - I havent got to the cake yet - but maybe I'll have a go at the bangers? jeanne - i saw that - it looks yummy! Anon - the point is that I try to only buy meat that come from reputable sources, where I know the animals are well treated and well fed and have a certain amount of room to roam around so that their short lives are as comfortable as possible. And I am prepared to pay the price for that. Cheapness is not the priority for me when I buy food. Well, the oxtail looks fantastic, Sam! Earlier this week I'd optimistically saved this recipe with the thought that I'd tackle it in the New Year.... I shall consider myself warned! I must agree on the standards of the recipes in Heston's columns. Missing steps and unused ingredients galore, but if you can get past that the results--as you've seen--are fantastic. I made this recipe yesterday. Actually yesterday, the day before and the day before that too. Because I have made a few of Heston's recipes before I pretty much knew what I was in for. special for 99c lb, and 2 lbs of oxtail at $5 lb (no special there) for the oxtail's truly great flavor. I bought some cheapo red plonk for $5 for 1.5L, so overall I was able to keep the cost down and the yield high. I got these really great vegetables, leeks, tomatoes, mushrooms, and on and on. Chop em up, fry em, and add them all in. And with a sinking feeling I realized that they were all going to be discarded. Sad. The result? An absolutely insanely great stew. And that is what Heston is all about: insane, and great. that I did this recipe for myself, to see if I could do it. feel obliged to go through such extreme torture for a stupid meal. Why thank you Sam! Go right ahead an post it if you wish. I updated my blog profile if you want a little more info on me. Another relative commented on the interesting and subtle sweet notes in the stew. I tried to wave it off as being the sweetness of the cooked onions, but nooooo, that wasn't good enough! So I was shamefacedly forced to reveal that yes, I had caramelized some turbinado sugar in a reduction of red wine vinegar. There is no limit to Heston's excess! With regards to the unrefined sugar: When Heston usually talks about unrefined sugar in his videos, it looks like a slightly darker version of regular sugar. I expect that the difference may be that he uses sugar from sugar beets, and not from canes - so the unrefined version is, so to speak, a lot more refined. you should cook the stew the jamaican way, with butter beans. also, if you cook it often, you should use a pressure cooker instead or your stove top - 2 hours or less.